We have a genius in the making here! 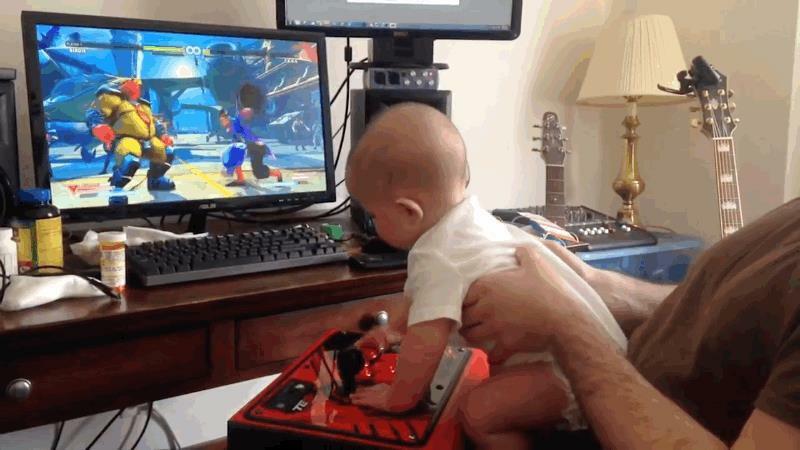 At six months old, if this baby can beat the story mode in Street Fighter V, imagine the moves he'll be able to pull off when he hits a ripe-old mature age. A regular Mozart of the arcade stick! YouTuber PapaPaint recorded his son "playing" Birdie's Story Mode, and when I say "playing," I mean smacking buttons as babies like to do. Now, Birdie's story is admittedly the easiest to beat, but give the kid a break, he's six-months-old. With a few more training sessions, M. Bison won't stand a chance. Wait, what's that I hear? It's the Street Fighter soapbox elite coming in to accuse this tyke of button-mashing. Some things never change, I guess. Street Fighter V is available now for the PlayStation 4 and PC, and I think this kid just proved to Capcom that the game seriously needs more single player options.